What's new at Hermann Hill! What’s new at Hermann Hill! The first 3 weeks of January have been busy up on the “hill!” We have begun the process of updating our Inn rooms. New rugs, chairs, and tables have been purchased and new linens have been ordered- but there is still a lot of shopping to be done. We also have been working with a local interior designer, Luci Valbuena from TerraFlora to pick out paint and furnishings. 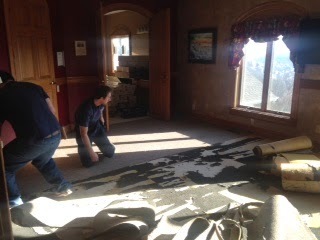 The major endeavor started today by taking out all the carpets in our rooms and replacing them with hard wood flooring and area rugs. We will keep you posted and share more pictures as these transformations take place! Thanks for making Hermann Hill the Best in the Midwest for the past 20 years!